Google announced a restart of Street View data capture operations, but in the wake of the fiasco about illegal wireless network snooping, there’s no Wi-Fi kit aboard Google’s cars. That fiasco is rolling on independently, however. Google’s made its announcement on its GooglePolicyEurope blog, rather fittingly since it’s in Europe that Google’s wireless network snooping rankled authorities. 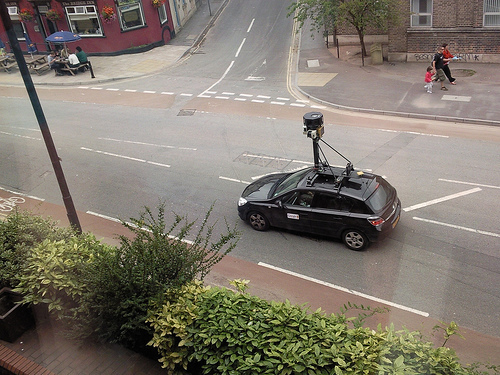 The post starts, promisingly, with an apology: “In May we announced that we had mistakenly included code in our software in Street View cars that collected WiFi payload data. As soon as we discovered our error, we not only stopped collecting WiFi data entirely, but also grounded our fleet of cars globally.” That was a smart move, and it gave Google time to remove all Wi-Fi tech from the cars. And if that’s not enough, “the independent security experts Stroz Friedberg have approved a protocol to ensure any WiFi-related software is also removed from the cars before they start driving again.” Google promises it won’t snoop on anyone’s wireless data again. At least for now, anyway. Street View data capture is due to restart in Ireland, Norway, South Africa and Sweden from next week, and the only data it’ll be recording is 360-degree photos, GPS locations and 3-D laser-scanned building contour data. Google’s notes that this is exactly the same sort of data that competitors Bing and TeleAtlas collect. Google, it seems, really has had its hands quite badly burned by this affair. And it looks like the pain may get worse, before it gets better. A report on the BBC News is highlighting a campaign by the Consumer Watchdog advocacy group to bring Google to justice for what it claims is “one of the biggest wire-tapping scandals in U.S. history.” There’s lots of mention of phrases like “drive-by spying” and descriptions of how much data Google was able to scrape. It really does make Google seem infinitely worse than even the wiretap-happy U.S. government itself. But the juiciest claims are that personal data for U.S. Congress members was among that grabbed by Google, including folks like Jane Harman–the head of the intelligence sub committee for the House’s Homeland Security Committee. Actually this news is particularly bad for Jane, as Consumer Watchdog says she has an unsecured wireless network that may (just may) have enabled sensitive national security-level data to leak out onto snooper’s computers. How did Consumer come across this data? By performing a limited scale Wi-Fi-sniffing experiment of its own–emulating what it suggests may have been the sort of data Google gathered. It’s a little underhand, for sure, but it certainly drives the point home. And with governments around the world still working out how angry they are at Google, how big will this fiasco go? It’s global in scale, so we may at some point even start to think of it as Google’s Wi-Fi-gate.